Iron Painter 2016 finished up a little over a week ago, but I was out of town on vacation when it did so I didn’t have a chance to post any kind of wrap up. I’ve finally gotten caught up on everything from while I was out of town and figure I ought to actually post a wrap-up for Iron Painter. With this piece I once again complete my journey to become an Iron Painter. This has been a crazy, exhausting competition and I am glad to say my journey is finally over. This year I pushed myself to create bigger and better pieces than ever before and managed to complete great pieces all five rounds and now I have five amazing new pieces living in my display case. My entries this year showed a marked improvement over my entries for last year. I even managed to make it all the way to the final round of the competition as a viable competitor, thanks in no small part to the new 3-tiered format for the competition. My final opponent, Erebi, was seeded as a Gold tier painter and was only bumped down to the Bronze after last round. You can see his entry here; you can also see all of the other entries in this gallery. The results of the competition are scheduled to be announced on Friday, so I will update you all once they have been posted. I was out of town all last weekend at Califaux, so I haven’t been around to update everyone on what work I’ve done on my Iron Painter final round entry. Since I lost a few days worth of painting time while I was out of town, it’s time to unleash my inner painting beast! Round 4 of Iron Painter 2016 has come and gone; the results have been posted and it turns out that the Iron is strong with me and I have defeated my opponent and managed to advance to the final round of the Iron Painter competition still counted amongst the competitors. With that being said, the final theme for Iron Painter 2016 has been announced: Critters! The message will still be delivered. Tell Ramos that the storm is mounting! Tell him that! You want to be like him, Joss! Tell him you need a new right hand just like his. Tell him that if he sends his “Right-hand man” back as an errand boy, I’ll rip it right off! Tell him! 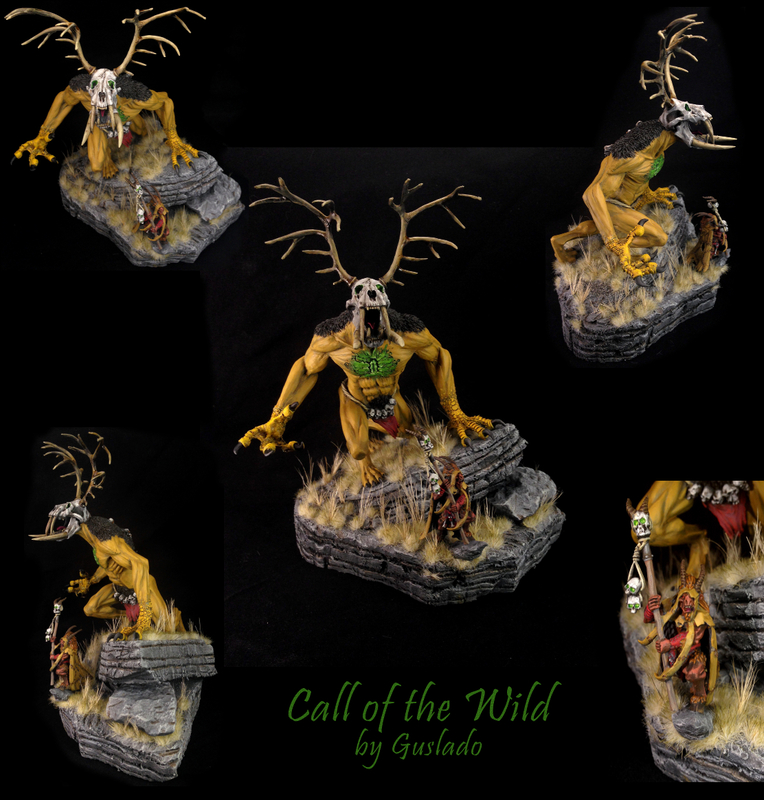 I am pleased to present you with my Round 4 entry for Wyrd’s Iron Painter 2016 painting competition! The theme for this round was “Armed and Dangerous” and my piece is titled “Cold Hearted”. This diorama is based off of a story by the same name which is one of my favorite pieces of lore from the background of Malifaux; it’s available in the older Twisting Fates Rulebook and you can listen to a great audio version of it on Wyrd’s Breachside Broadcast podcast episode #25. I’m happy with how this piece turned out, hopefully it will be enough to defeat my opponent cOMA! There are some really great entries (as always) this round which you can check out over on this gallery on the Wyrd forums (also, here’s a link to my opponent’s entry).The results are scheduled to be posted this Friday, so as soon as I know whether or not I advance, I will let you all know; even if I don’t manage to defeat cOMA, I will still complete and entry for the final as the Iron is strong within this painter! The end of my quest is within sight! An Iron Painter’s Quest 2016, Episode 15: To The Batcave! With a little less than a week left until my Round 4 entry I have all of the fabrication for my diorama finish, so it’s time to get painting. Quick Robin, to the Hobbycave! Na na na na na na na na na na na na na na na na Paintman! An Iron Painter’s Quest 2016, Episode 13: More Pink Foam! General busyness in life persists, which means that on failed to update you all on how I ended up faring in the Round 3 of the Iron Painter competition. Good news everyone! I advanced! In a very tight decision I managed to defeat the wonderful SnickerSnackStudios with a score of 42 to 36 and advance to the fourth round of the Iron Painter competition as an ongoing competitor in the Bronze tier. In a crazy twist of fate I somehow pulled in the 2nd highest score in the Bronze tier and my opponent pulled in the highest score of those eliminated; due to a few drop-outs in the Silver tier, the highest score in the Bronze tier was moved up to the Silver tier for the next round and SnickerSnackStudios was thrown back into bronze tier contention due to her having the highest eliminated score, which is great because she really deserves to keep going in the competition. I am pleased to present you with my Round 3 entry for Wyrd’s Iron Painter 2016 painting competition! 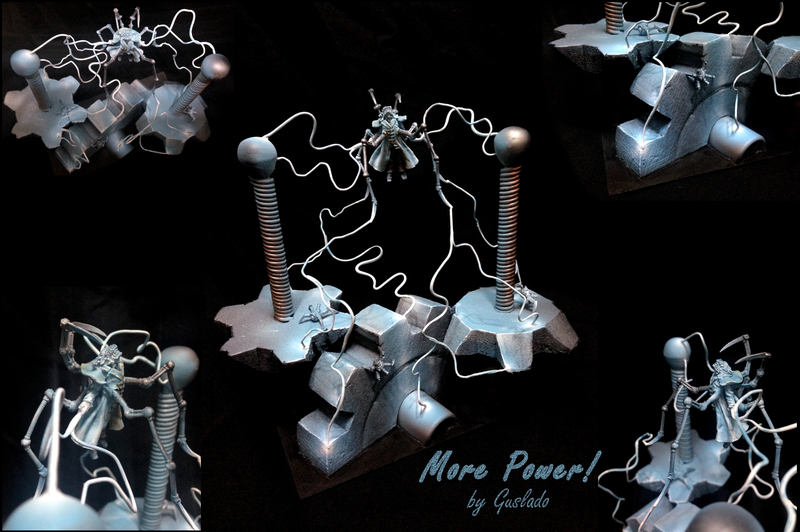 The theme for this round was “Wyrd Science” and my piece is titled “More Power!” I’m really happy with how this piece turned out, hopefully it will be enough to defeat SnickernackStudios! There are some really great entries (as always) this round which you can check out over on this gallery on the Wyrd forums (also, here’s a link to my opponent’s entry).The results are scheduled to be posted this Friday, so as soon as I know whether or not I advance, I will let you all know; even if I don’t manage to defeat SnickernackStudios, I will still continue to complete entries every round as the Iron is strong within this painter! To Episode 13: More Pink Foam!